A camshaft—this may still be Greek to you and me so here goes!!! The #camshaft is critical to the basic function of an #engine. It has two distinct parts: the #cams and the #shaft, the camshaft is the element that enables #valves to open. As the shaft rotates, the egg-shaped cams (or “lobes”) push the valves open in sync with the crankshaft gear. A Crankshaft is a shaft which transmits the power developed by the engine to various parts of the vehicle. As one website put it: the major link between the input and output of the vehicle. If the crankshaft was broken your vehicle would not even move. 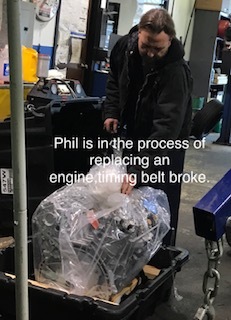 If the timing belt snaps, it can cause bent valves (most common), cylinder head or camshaft damage, and possibly piston and cylinder wall damage. While it is possible that no damage could occur from a snapped belt, the only way to fully access the damage is to get it towed, to Ricks Auto Service here in Mishawaka, IN. How could this be avoided? There is an owners manual that states how often this belt should be changed. With regular maintenance we would of noticed the frayed or cracked belt, looked up your mileage and have a conversation about getting this belt changed. You don’t want to have to have the engine replaced.